A brutal triple murder. Dark and deadly deeds in a remote northwestern crofting community in 1869 lead to the arrest of a young man by the name of Roderick Macrae. There's no question that Macrae landed the savage blows, but it falls to the country's finest legal and psychiatric minds to uncover what drove him to commit such merciless acts of violence. Was he insane? Only the persuasive powers of his advocate stand between Macrae and the inevitability of the gallows at Inverness.Will he swing for his wicked acts? Graeme Macrae Burnet is one of Scotland's brightest literary talents. 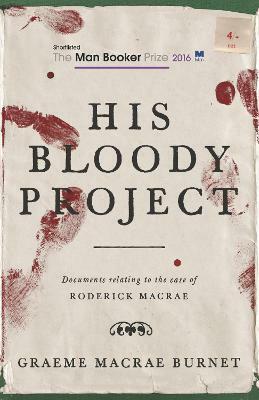 His second novel, His Bloody Project, was shortlisted for the Man Booker Prize 2016, won the Saltire Society Fiction Book of the Year Award and the Vrij Netherlands Thriller of the Year, and was shortlisted for the LA Times Book Awards. It has been published around the world, and a bestseller in several countries. His third novel, Accident on the A35, longlisted for the Theakstons Crime Novel of the Year and the Harpers Bazaar Modern Classics awards, returns to the small-town France setting of his first novel, The Disappearance of Adele Bedeau (Contraband, 2014) - a cult hit that was longlisted for the Waverton Good Reads Award.